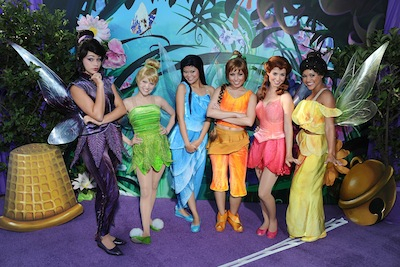 Tinker Bell, Rosetta, Iridessa and Fawn were there live to greet all of their fairy friends. 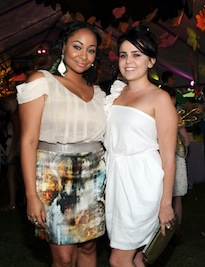 They were joined by film talent Mae Whitman (voice of Tinker Bell), Raven-Symonѐ, Michael Sheen, Pamela Adlon, Rob Paulsen, Dominika Paleta, director Brad Raymond & producer Helen Kalafatic as well as Jason Earles (Hannah Montana), Billy Bush, Gilles Marini (Brothers & Sisters), Chris Cornell (Soundgarden), Mark Feuerstein (Royal Pains), Ariel Winter (Modern Family), Rick Fox (Ugly Betty), Zendaya Coleman (Shake It Up! ), Roshon Fegan (Camp Rock 2: The Final Jam) and Landon Pigg. The very special outdoor premiere of Disney’s All-New Movie Tinker Bell and the Great Fairy Rescue was screened for more than 1,000 families in the local Los Angeles area. The event featured a dozen of L.A.’s most popular food trucks, including Top Chef alum Brian Hill’s gourmet food truck, along with a bevy of activity stations for the kids – including face painting, Tink tattoos, coloring stations and Radio Disney, who emceed the event. All fairy attendees received Tinker Bell blankets, Tinker Bell glow sticks, Fairy wings and enjoyed many Fairy activities. Tinker Bell, the world’s favorite fairy, will be spreading her magic for audiences of all ages, as the worlds of fairies and humans converge for the very first time in Tinker Bell and the Great Fairy Rescue. An all-new original full-length CG animated film featuring breathtaking animation, spectacular music and an all-star cast of voice talents debuts September 21st on Blu-ray Combo Pack (includes Blu-ray and bonus DVD of the film and movie download) and DVD.